Training for your first 5k or want a good running/general fitness routine, or have specific time goals for a 10k, half or full marathon? Let's work together! Rachel is a RRCA Certified Running Coach and Pre/Post Natal Exercise Specialist. 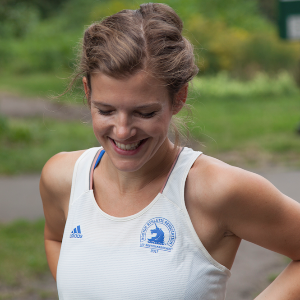 She is a 3x Boston Marathon qualifier (each time running qualifying times less than a year postpartum), so she understands firsthand what it is like to get back into running and general fitness after having kids. Contact Rachel for training plans & coaching. Rachel is a RRCA Certified Running Coach, a Pre/Post Natal Corrective Exercise Specialist, and wellness enthusiast. A ten-time marathoner, Rachel has also run over 25 half marathons and countless other races, consistently finishing in top 1% of her age group and gender. She is a 3-time Boston Marathon qualifier, the first 2 times running qualifying marathons less than a year postpartum. Rachel is also a New York Road Runner pacer for both full and half marathons, a former head coach for the Leukemia & Lymphoma Society's Moms In Training program and JackRabbit Sports' training programs, and currently coaches privately and in group settings with New York Road Runners and Grand Army Pacers. When she doesn't have her running shoes on, Rachel is an experiential event producer, project manager, and writer. Success. Coach Rachel Spurrier has been notified of your message.